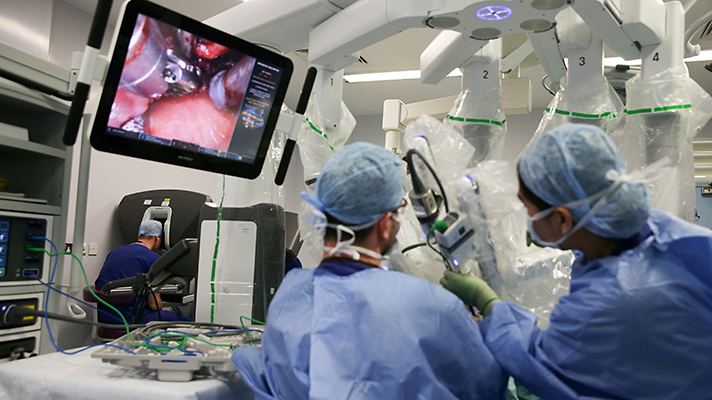 The intersection between emerging tech and surgery is a topic of high interest. Putting aside sci-fi projections of the ‘rise of the machines’ and romantic visions of near-humanised droids, here we look at the current and future applications of artificial intelligence (AI) and virtual reality (VR) in surgery, and perhaps the most practical current tech application: augmented reality (AR). In the UK, the Royal College of Surgeons has launched an independent commission to explore the future of surgery, which aims to set out a ‘compelling and credible vision of the future advances in medicine and technology, and how those developments will affect the delivery of surgical care’. In addition to the topics outlined above, commissioners are considering advances in surgical innovation, including minimally-invasive surgery, genomics, 3D printing, robotics, and genomics. We spoke with one of the commissioners on the Future of Surgery panel, plastic surgery registrar and honorary lecturer Dr Nadine Hachach-Haram, who has also co-founded the device-agnostic AR platform, Proximie, which enables doctors to work virtually with colleagues. Hachach-Haram has also recently received a British Empire Medal in this year’s Queen’s birthday honours list for her innovative work within the field of surgery and medicine. We also spoke with Professor Kaspar Althoefer, Director of Advanced Robotics at Queen Mary at Queen Mary University of London, and Peter Wells, Head of Policy at the Open Data Institute. “We don’t want tech that’s just cool and exciting – we want tech that actually has impact here and now and in the future,” says Hachach-Haram, emphasising the importance of patient need driving the tech, rather than the other way round. “We are on the front line and we’ve seen the problems. We want to adopt technology that’s going to make that difference; that’s going to help us deliver optimal care to our patients; a better experience, a better patient journey – that’s what’s important.” More efficient, better tech also benefits the surgeon too – streamlining processes and avoiding duplication. "We wanted to take our inspiration from biology – so octopus tentacles were our inspiration....making something that was made of soft materials, to achieve more dexterous behaviour but also to increase patient safety." When asked the inevitable ‘will robots replace humans?’, Hachach-Haram states: “Not at all. I believe there are some areas where technology in general can play a bigger role, for example machine learning or precision medicine, as we are seeing a shift towards ‘predictalytics’ and preventative care”. She underscores that, rather than replacing, the power of tech is also in the up-scaling and sharing of expertise, building a trusted community or ecosystem – by clinicians, for clinicians – supporting shared decision making across multi-disciplinary teams. With the caveat that he can’t predict the future, he says that the process of automation will continue and in some cases fully-automated systems may replace human–robot systems in the long run: “I suppose there will be a time when certain tasks will be completely automated, like suturing – maybe the surgeon will only need to highlight the areas that are to be sutured, and the rest will be done by the system. And that will continue, and possibly one day there will be a completely automated system to conduct entire surgical procedures; [however], we are very far from this,” he says. When asked if we are overly reliant on technology, he makes the comparison to GPS and satnav technology – that humans indeed rely very much on these systems, but the benefits far outweigh the ‘risks’ of reliance. He adds: “I can only stress the point that we are very much at the beginning – I believe the more technology is developing the more we will be relying on the systems. And it can give us better outcomes. There are certain things humans cannot do as well as technology can do it, so why reject that?”. "Healthcare professionals talk to each other, we collaborate, we share ideas, we share experiences, we share difficult cases, we learn from each other. It’s very much a social way of working and AR and mixed reality promote this very effectively." “We can see the effective use of virtual reality in simulation, in terms of preparation and rehearsal – the challenge here is the cost of scaling as there are tens of thousands of different procedures with nuances in each of them,” says Hachach-Haram. “And while the full range of the possibilities of artificial intelligence has not yet been realised, theoretically, we know the scale and impact will be significant,” she says. As well as verbal evidence, the commission has received written submissions about the ‘game changing’ nature of VR in areas such as anatomical education, particularly in the ‘virtual dissection table replicating a real cadaver bed’, with the benefits of global availability and bypassing the legal, consent and supply issues. Outside of training, Hachach-Haram notes that “… VR has very strong uses in areas like paediatric pain management and enhanced recovery,” but notes the importance of recognising the limitations and benefits of each type of emerging tech, and being able to identify where they can be beneficial but also where they don’t necessarily add value. "If we are to retain trust and make the most of the potential of data then handling it ethically needs to become normal practice, just like medical ethics." As well as relying on high quality algorithms, AI and machine learning are only as accurate and effective as the data that feeds them. And with recent data scandals, notably Facebook and Cambridge Analytica, what are the ethical questions around data? “Ultimately, if data is used with the right intent, with the proper consents in place, and the necessary/appropriate compliance, then it can be done, and with the introduction of blockchain this will become more and more important,” says Hachach-Haram. She notes her experience that patients generally say they are happy for personal data to be used, with the right consents and safeguards in place. With consent as one of the lawful bases for processing personal data under the General Data Protection Regulation (GDPR), this is a topical point. Peter Wells, Head of Policy at the ODI, said: “If we are to retain trust and make the most of the potential of data then handling it ethically needs to become normal practice, just like medical ethics. Unfortunately it’s not yet normal practice and the necessary debates haven’t happened at a wide enough scale to know what normal practice would even look like. A key technology in healthcare, Hachach-Haram argues, is AR. “I find AR really exciting because it’s about taking your natural world, your real world, and superimposing and augmenting with computer-generated digital content to break current boundaries and achieve more,” she says. “If you think about the future of mixed reality in which you could be in your workspace, in your day-to-day activity, but being fed information and content from various virtual sources: this adds value and is very relevant to helping you deliver more efficient, better quality care,” she says. Hachach-Haram describes a recent case where an AR system meant that a surgeon in Amsterdam could work with a surgeon in Cardiff on a complex cancer case: “If the technology hadn’t been there, it would have been a struggle’ she says. Scaling is where AR really shines, says Hachach-Haram, explaining that as well as the immediate benefit of layering virtual content onto real situations, it provides the opportunity to share and replicate expertise. “At Proximie, we believe in scaling expertise and being able to connect clinicians to engage and collaborate. AR and mixed reality are very collaborative, lending themselves very well to healthcare. However, given the global pressures in healthcare, we believe, the key is to scale these technologies without having to invest vast amounts on hardware – Proximie allows clinicians to extract the true value from AR technology with their existing hospital infrastructure,” she says. As part of EU-funded project STIFF-FLOP, which ran from 2012 to 2015, Althoefer worked with a team to create, a ‘highly dextrous soft robotic arm able to locally control its stiffness from a soft state to a stiff one as required by the task, i.e., for the arm to be compliant with the environment when, for example, advancing towards the surgical site and to stiffen up, for example, when manipulating tissue’. Will tech create generalists or specialists? Hachach-Haram notes the trend towards subspecialising in surgery, regardless of tech: “Even within my specialty, you have four or five different subspecialties,” she says. Inevitably, this leads to more niche skills held by fewer people. And this leads back to tech and AR: “So then what happens? – because you’ve become so specialised, because there are so few people doing what you do in the required volume [with the required] expertise, you want to continue to share that expertise globally. So how do we scale you?” she asks.